The 2018 Honda CB 125F is likely to be the automaker’s promised new product for India. It will find its place above the CB Shine SP in the manufacturer’s line-up. Expect the launch to happen in India this year. Recently, Honda 2wheelers confirmed that it is going to launch one brand new product followed by 18 updates for its existing model line-up in India. 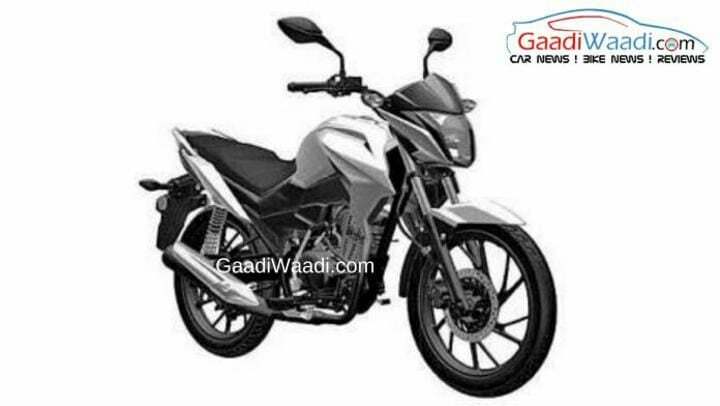 Curtsey Gaadiwaadi, patent images of the 2018 Honda CB 125F have surfaced on the internet. This bike could very well be the new product set for a launch in India by Honda two-wheelers. The design of the 2018 Honda CB 125F is completely different from the older model. The front headlamps and the tank shrouds feature a new look. Furthermore, the bike gets new visor and mudguards. While the there are subtle aesthetic changes on the fuel tank as well. The seat of the new CB 125F is now wider and placed slightly lower than before. Furthermore, the bike comes with split grab rails. In addition to this, the report states that the bike is going to get LED headlamps. The 2018 Honda CB 125F is going to get the same engine as the CB Shine SP. Hence, the unit is a single cylinder, air-cooled 124.73cc unit. The motor produces 10.1 BHP of power along with 10.30 Nm of peak torque. The bike is going to come with a 4-speed manual transmission. Consequently, expect the mileage of the new CB 125F to be around 60 to 65 km/l. It is likely that Honda will launch the 2018 iteration of the CB 125F this year itself. The model is going to find its place above the Cb Shine SP in the automaker’s line-up. It is likely to cost around the mark of INR 65,000. Honda is currently working in full swing to prepare their products for the BS-VI deadline starting year 2020. For this, the automaker is also going to modernize their manufacturing plants. Some of the recent launches from Honda include the CBR 250R, CB Hornet 160R, Activa 5G, CB Shine SP, Livo, Dream Yuga and X Blade. The two-wheeler manufacturer has clocked a significant increase in sales for the financial year 2018-19. Furthermore, it plans to invest a total of INR 800 crore to expand its operations in our country.